Hicklin Gets Five Versus Bloxwich. September 1954 – (C) Birmingham Daily Gazette. Highs and Lows Versus The Wolves. December 1949 – (C) Birmingham Daily Gazette. November 1953 – (C) Birmingham Daily Gazette. Financial Troubles, Suspicious Fires and Losing your players. History has repeated itself time and time again for Bilston. But you can’t keep a good club down. (C) Birmingham Daily Gazette, Birmingham Daily Post. T. R. Wood – Director – Bilston United. Open Air Boxing at Queen Street. 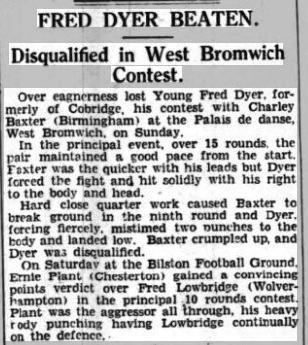 6th June 1930 – (C) Birmingham Daily Gazette. (C) Aberdeen Evening Express, Sports Argus, Liverpool Echo.